By promoting critical thinking and fostering intercultural understanding, the University aims to provide state of the art American liberal arts education with a global perspective to students. 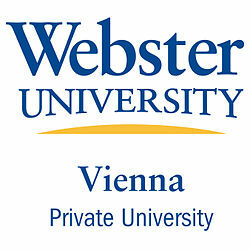 Webster Vienna students take courses in an academically rigorous environment defined by small classes, integrated theory and practice, state-of-the-art research, internationally recognized faculty, and practical application. With students from over 70 countries and a faculty from over 20 countries, the University offers a diverse and multicultural environment. Graduates are truly global citizens with an international perspective and top-notch skills, capable of immediately applying their knowledge while operating in a diverse multi-national setting. Well-known for its small classes (25-30 students per course), WVPU guarantees that students interact closely with each other and faculty creating opportunities to question, challenge, and embark on independent research while focusing closely on foundational knowledge, practical skills, and up-to-date data, methods, and approaches. Students build long-lasting relationships with each other and with staff and faculty, many of whom bring decades of experience and extensive networks. In short, WVPU fosters a culture of mentorship that opens doors and lasts a lifetime. Its focus on integrating research and teaching enables students to not only learn about ongoing research trends, but also to actually participate in on-going research projects, among others from archive research to interviews to lab tests. Students learn first-hand the essential requirements of participating in projects, meeting deadlines, and producing quality written and oral work. By integrating students into faculty research, WVPU engages and empowers them in ways not typically available in traditional coursework. This approach provides value-added guidance, encouragement, and support. It is through this close interaction with faculty and through exposure to a diverse set of ideas, topics and approaches that students are able to decide upon career paths and the next crucial steps in their lives.